- Apt for straight staircases or slight curved (at the top/bottom) with the use of ramps. - Up to 130 kg weight capacity. - Maximum voltage: 15V of alternate current. 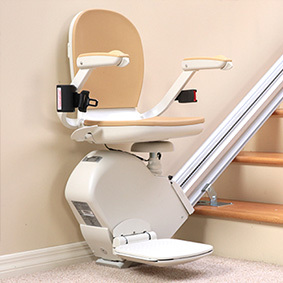 - Only requires a standard plug/power outlet at the top or bottom of the stairs. - Includes 4.7 m of track. - Operated through remote control and through the arm rests of the chair. - Safety mechanisms included such as a seatbelt and sensors. - Batteries automatically re-charge while not in use. - Fixed to the steps, not the wall.